Although my primary reasons for going to Oregon were visiting family and eclipse watching, I did manage to get in a little bug hunting as well. One of the nice things about the hobby is you can do it nearly anywhere outside of Antarctica. 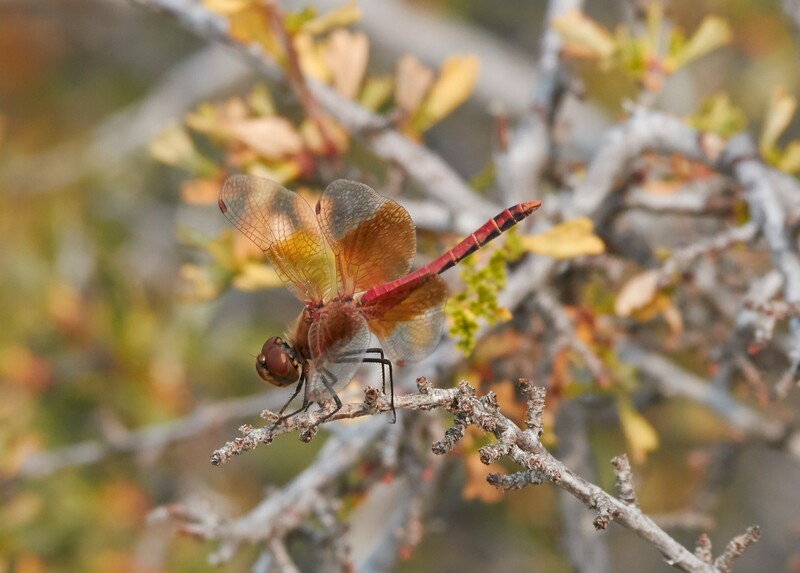 Central Oregon's high desert is a far cry from our coastal climate so I expected some seriously different critters. My nephew took me to a tiny ¼-acre pond. In the dry places on Earth, life is concentrated around any water, and this basalt-lined pool was no exception. Dozens of dragonflies, damselflies, wasps and flies buzzed and flitted about with dizzying speed. 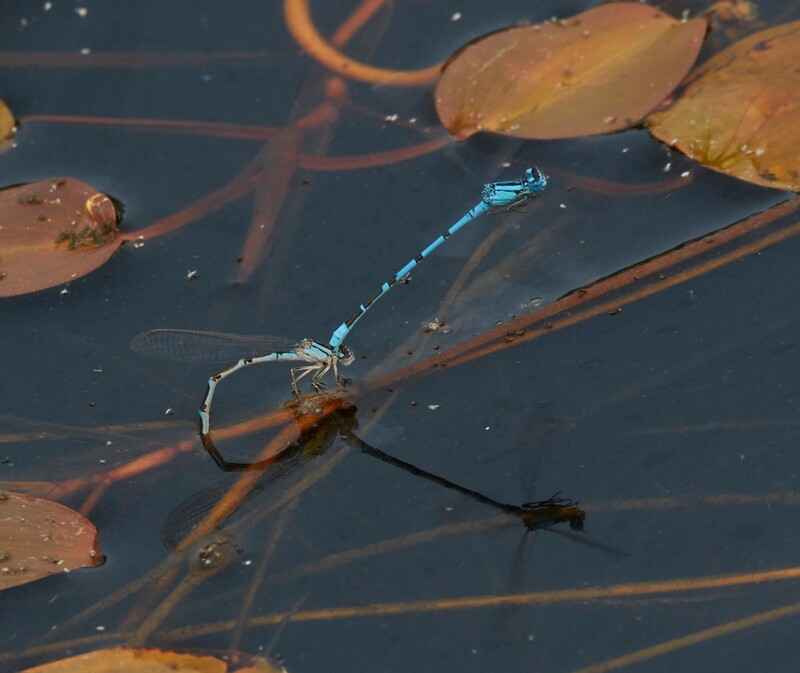 A pair of bluets laying eggs. There were a lot of small to medium sized dragonflies, including a band winged meadowhawk (Sympetrum semicinctum), several pairs of striped meadowhawks (Sympetrum pallipes), and several pairs of spotted spreadwings (Lestes congener), adding two dragonflies and one species of damselfly to my lifelist. The spreadwings I got to photograph are badly infested with mites, which will prevent them from mating successfully. Spotted spreadwings infested with mites. A pair of bluets (species not determined) were ovipositing (egg laying). 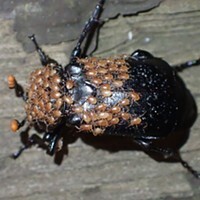 In this and many other species, the male clasps the female behind the head lending support and excluding any other males from interceding. 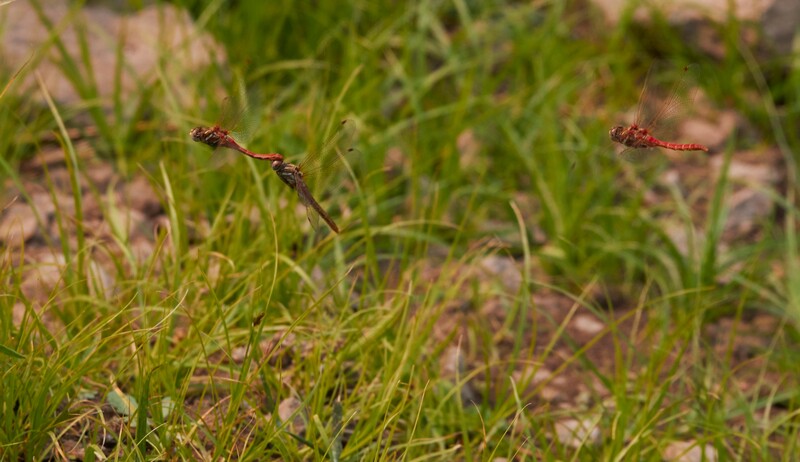 Male striped winged meadowhawk chases a mating pair. 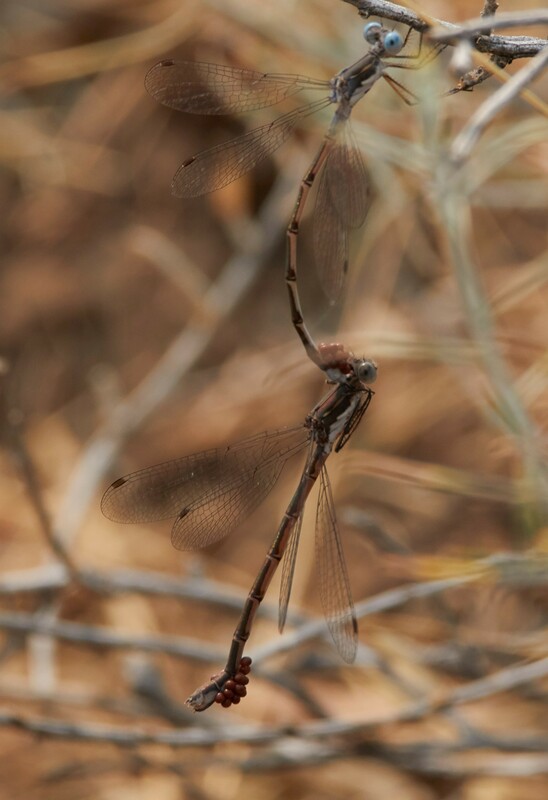 Of course, there were familiar species as well, including one care worn eight-spot skimmer (Libellula forensis), reminding me that these creatures live only a few short weeks as adults. Later in the evening, my son took my two young great nieces on a black light safari. 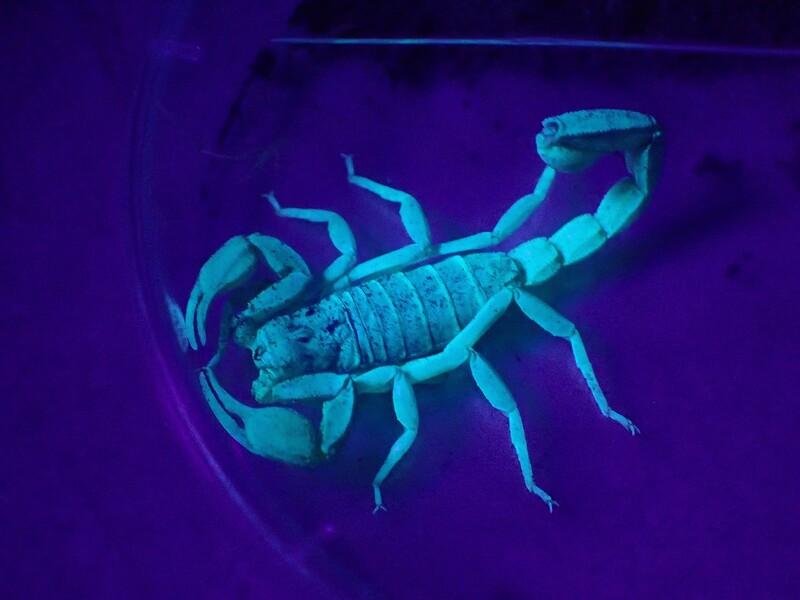 Within 50 feet of their home, they found half a dozen small scorpions, most likely (Paruroctonus boreus) the northern scorpion. Curing them, I think, of walking about barefoot in the dark. A reason to wear shoes at night — and check them before putting them on!